Originally a meal reserved for the royal class, Dubu Jeongol has achieved a popularity that cut across all classes. 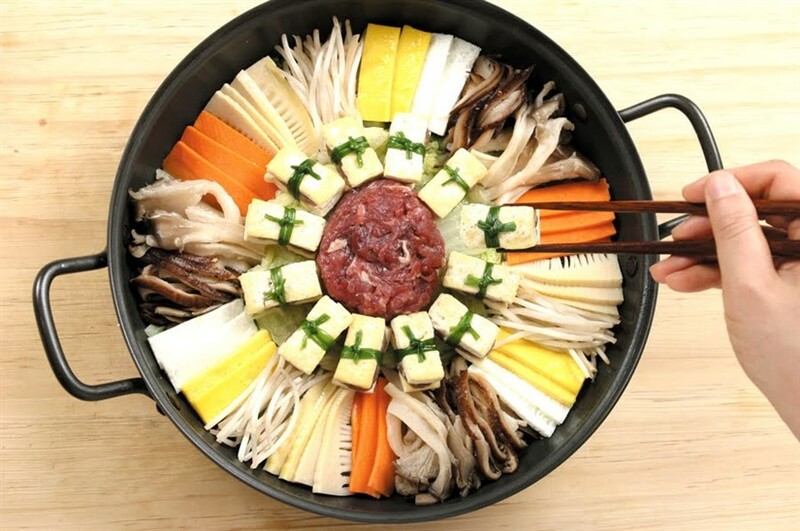 It is a communal dish that fits perfectly into the Korean dining culture of several people eating from a large pot in the centre. Loved for its invigorating warmth, Dubu jeongol is regarded as one of the best meals to combat winter blues. Many Koreans prefertheir Dubu Jeongol spicy but the red pepper can be adjusted by those who prefer a milder taste. Dubu jeongol is rich in protein and soft in texture. It is a dish of tofu, beef and vegetables with seasoned broth poured over the mixture. Serve with rice and other side dishes. Koreans usually serve the meal in a big hot pot and allow the family or guests to serve themselves. Dubu jeongol is prized for its low calories and delicious taste. Vegans can replace the beef with mushrooms to make a similar Korean dish called Dubu-busut jeongol.